Visit County Durham, the destination management organisation approached DebSharratt Communications to fulfil their PR requirements while a vacancy was filled. Over a 15 month period, DebSharratt Communications exceeded the objectives set for the full-time role, working the equivalent oft three days per week. The role focussed on generating positive media coverage in regional, national and international media in the travel, lifestyle and culture pages, as well as being responsible for all work relating to the company's image, reputation and stakeholder communications as well as growing the company's online communities. 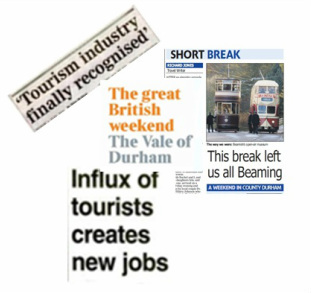 The role also involved promoting Durham's key cultural events including: Streets of... , Lumiere, Bishop Auckland Food Festival and Durham Regatta and award schemes such as Tourism Awards and TaseDurham.